Diekmann can be best described as a journeyman; both in his personal and business life. He had launched his own publishing business, Diekmann/Thieme, in 1983, straight out of university. The company produced travel guides and adventure books, one of which detailed his own experiences on canoe trips through the more remote regions of Canada. In 1988, frustrated with having to compete with the big publishing houses, he left his business to become assistant to the head of Allianz’s Hamburg office. From there he assumed responsibility for the company’s Hamburg sales office in 1990, before becoming head of sales for the company’s North Rhine-Westphalia region four years later. In 1996 he moved to Singapore to head up Allianz’s Asia-Pacific business. His next move would take him to the US, where he led Allianz’s North American insurance operations. It was from this position that he took on the role of CEO. Whereas his appointment sent shockwaves through the company, an examination of Diekmann’s career at Allianz helps explain why Schulte-Noelle nominated him as his successor. During his tenure as head of Allianz’s Asia-Pacific operations, he oversaw several key acquisitions, introduced a new corporate infrastructure and implemented new pricing models. The result of which turned around the fortunes of a failing division. Furthermore, upon taking control of the firm’s North American operations, he was faced with the challenge of saving the hugely-underperforming US Fireman’s Fund – Allianz’s key US insurance subsidiary. Ruthless in his approach, Diekmann moved to centralise the US operations, streamlining it by cutting thousands of jobs and focusing more on providing insurance products to more wealthy clients, such as commercial property owners and high-net-worth individuals. Further to this, despite an increasingly bleak forecast for the Allianz group as a whole, Diekmann took the decision to inject $730m into the Fireman’s Fund, effectively saving the business. In 2003, Allianz was in a state of unprecedented turmoil. The main thorn in Allianz’s side was Dresdner Bank. Schulte-Noelle had spearheaded the $22.5bn acquisition of Dresdner in 2001, announcing to the market that the deal would transform Allianz into a bancassurance powerhouse by virtue of selling insurance products to Dresdner’s substantial client base. The result, however, was very different. By the second quarter of 2002 Allianz’s share price had fallen from $400 to less than $110 and the combined group’s market capitalisation stood at less than $26bn – just $4bn more than it had paid for the bank. Allianz’s Q3 losses of $2.5bn were its first deficit since the Second World War, and the Dresdner acquisition had contributed to a massive $1bn of this total. Even before Diekmann took to the hot seat Allianz had begun to implement damage-limitation measures at Dresdner, closing 300 branches and announcing approximately 8,000 redundancies. In addition to this, the bank’s investment-banking subsidiary, Dresdner Kleinwort Wasserstein, had been warned of a probable one-fifth cull of its total staff base. Diekmann, with his aggressive approach to crisis-management, made several key decisions in order to remedy the situation at head office. The most startling was to make around 15,000 Dresdner employees redundant. Then he implemented a $5bn rights issue to bolster the group’s finances. Following this, he announced his intention to divest non-core businesses. All told, within just 12 months, Diekmann returned Allianz to a healthy financial position, with net profits closing on near to $2bn for 2003. Understandably, Diekmann spent the period 2003-2007 getting Allianz’s house in order in the wake of its disastrous Dresdner acquisition. Following this, in 2008 Diekmann laid out plans to divide Dresdner into two separate subsidiaries, with aim of selling off its investment-banking division, Dresdner Kleinwort. This move, Diekmann suggested, would allow both Allianz and Dresdner Kleinwort the necessary breathing space, especially in view of the trend towards consolidation within the investment banking market. In a further strategic move towards consolidation within its principal insurance operations, in 2008 Diekmann announced that Allianz would buy out the shareholders of both its French and German operations, in a deal valued at some €10bn. At the time, Diekmann said that taking full control of these individual business units would help Allianz create a strong platform to better serve its European clients while and at the same time further bolster its operating profits. This deal was the culmination of a restructuring plan – announced in 2005 – that has seen the group’s corporate structure change from a German Aktiengesellschaft (AG) to a European-incorporated Societas Europaea (SE). Such shrewd decisions have benefitted Allianz commercially. In Q3 2010, revenues increased by 11.4 percent from that of the previous year, to €24.5bn, and operating profit rose by 2.3 percent to €2.1bn. Even in the wake of the Dresdner buyout, the group is also looking to make strategic acquisitions once again, and is reported to be currently putting together a £2bn bid for the Channel Tunnel Rail Link. In 2001 Allianz took a tactical gamble in acquiring Dresdner. On paper, nothing could go wrong. The synergies between the two businesses would make the combined group the biggest bancassurance firm in the world. But it turned out to be an expensive gamble. 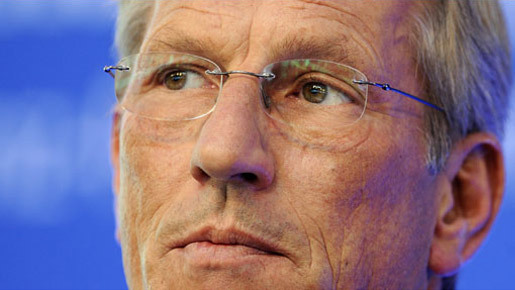 Whereas Henning Schulte-Noelle had gambled on making Allianz into a global insurance empire, it was left to Michael Diekmann to pick up the pieces when the plan went badly awry. With a reputation as a tough task-master and an unflinching approach towards cost-cutting and redundancies, he was tailor made for the role of cleaning up the mess. But, having spent the bulk of his Allianz career managing difficult situations, he now finds himself in the unfamiliar position of being able to build upon a profitable business through expansion and acquisition. As a professional fixer, it remains to be seen whether this role will suit his skill sets.